Amid reports that the U.N. High Commissioner for Human Rights is set to publish a blacklist of Israeli companies operating in territories captured by the Jewish State in the 1967 war, there is concern that the anti-Israel atmosphere at the United Nations could get even worse following the departure of Nikki Haley as the U.S. ambassador to the world body. Haley stepped down on December 31st. “The U.N. is on Israel’s case more than ever before. I think the departure of Haley plays a role,” says Jenny Aharon, director of the Golden Gate public affairs group and a World Jewish Congress (WJC) diplomat. “Also at the U.N. Human Rights Council, they are set to condemn Israel more than ever before,” she told World Israel News. In June, the United States announced that it was withdrawing from the Human Rights Council over what it called chronic bias against Israel and a lack of reform. At the time, Ambassador Haley charged that the “disproportionate focus and unending hostility toward Israel is clear proof that the council is motivated by political bias, not by human rights.” Israel’s Prime Minister Benjamin Netanyahu welcomed the U.S. decision to pull out of the council. Haley has not been replaced. Jonathan Cohen is her acting successor. The council was created in 2006. U.N. officials said the United States was the first member to withdraw from the council. Among reforms the U.S. had pushed for was to make it easier to expel member states who have egregious human rights records. Currently, a two-thirds majority vote by the 193-member U.N. General Assembly is needed to suspend a member state. 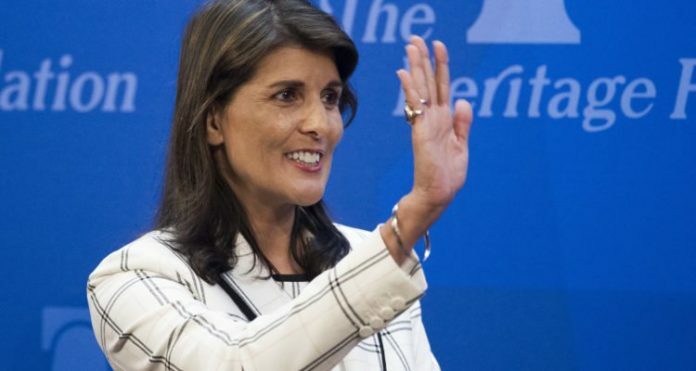 “Look at the council membership, and you see an appalling disrespect for the most basic rights,” said Haley in June, citing Venezuela, China, Cuba, and the Democratic Republic of Congo. The blacklist against Israeli companies operating over the “green line” is expected to be released next month. It is said to include some of Israel’s largest companies and could expose them to legal action abroad. Israeli officials credit U.S. efforts for delaying the publication of the list until now. The territories involved are eastern Jerusalem, Judea and Samaria, and the Golan Heights. Israel also captured the Gaza Strip and Sinai in the 1967 war but later withdrew. Companies informed that they may be on the list reportedly include Teva Pharmaceutical, Elbit Systems – a defense electronics company, the Rami Levi and Shufersal supermarket chains, Egged transportation, Bank Hapoalim, and Bank Leumi. In January 2018, a report from the U.N.’s Office of the High Commissioner for Human Rights noted that 206 companies were doing business in these territories, but did not list them. Previous articleWhy is France facing an upsurge in anti-Semitic attacks?